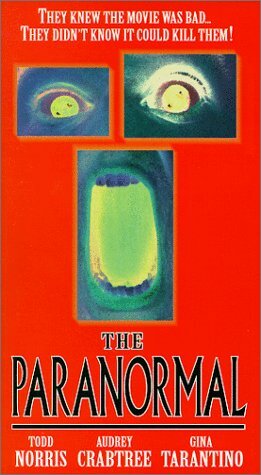 I wrote the script to “The Paranormal” in 1993, before the “X-Files” premiered and way before zombies returned to pop culture. At the time I wrote it, I was in love with Romero’s “Dawn of the Dead” and also John Carpenter’s movies. Also, two of my favorite films were “Poltergeist” and “Aliens”. In a way, “The Paranormal” is an attempt to fuse all the things I liked about those films into one movie. I made the movie take place at a haunted movie theater because I knew I could get access to the Englewood Theater, since I worked at another theater owned by the same people. The budget was about $2,000. Not including the cost of the camera. What was the movie shot with? It was shot on a Canon A-1, which was a Hi-8 digital camera. Where was it shot? Any info on the theater? The main location was the Englewood Theater in Kansas City, which is also where Englewood Entertainment was based. I worked at its sister theater, The Fine Arts as assistant manager. The Fine Arts was also a video store and, in fact, it had the best selection of old and obscure movies in town. I ran the video store and was also a projectionist, sold tickets and popcorn. The Englewood was an old movie palace on the other side of town that the owners restored and re-opened as a revival house. It was a great location. But actually, The Fine Arts auditorium doubles as the Englewood auditorium for a lot of the close-ups, which I shot later. What were some of the challenges of making the movie? Money. Or lack thereof. And my lack of experience shooting something feature length meant that I ran out of money before I was even half done filming. All the actors were very good and very motivated to succeed. Because of this, two out of the three actors left Kansas City to advance their careers before I could finish filming. I couldn’t blame them, as I had no money to entice them to stay and finish my movie. My own inexperience had lengthened the shooting schedule beyond what they’d originally committed to. Because I knew they were leaving, I did a massive rewrite of the second half of the movie, which is why my character ends up going alone through the movie screen and into the zombie movie. It was originally written that I go in with Lynne. So I came up with the idea of wearing a headset, so that my character could talk to the other characters without having to be in the same location. I begged the actors to shoot one more weekend before they left town, and I filmed all their “headset” dialog for the second half of the movie in a day. Then I spent another two years, off and on, filming on the weekends when I could get a crew together. It took a year or so to edit. I started shooting in 1994 and I premiered it in 1998! Another challenge in making the movie was that my apartment got burgled at one point and my camera was stolen, along with a few of the master tapes that were in the camera bag. Luckily, I had just backed up those tapes to S-VHS a few days before that. So a significant amount of the movie is edited from the second generation backups. I still get anxiety just thinking about that. Can you tell us about any of the cast and crew? I held auditions in the lobby of the Englewood and I still am very proud of the casting choices I made. Audrey Crabtree (Lynne), Lisa Winegar (Cass) and Gina Tarantino (Johnny) are all very talented actors and went on to do bigger and better things after “The Paranormal”. I’m still in touch with them via social media. Kurt Branstetter, my director of photography, moved to Chicago and has made a living shooting commercials and other cool projects. 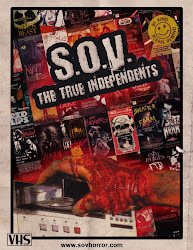 Jeffrey Sisson, who did the makeup FX and also played the zombie who bites the guy’s foot, has directed horror films of his own. He currently is in a death metal band called Troglodyte and directs death metal music videos, among other creative projects. We always used to quote lines from “Dawn of the Dead” and “The Fog” and crack each other up. We still do whenever we see each other. Was it difficult acting and directing at the same time? Yes! I wasn’t originally supposed to act in the film. Here’s what happened: I originally cast David Snell to play Kyle. David Snell later became known for playing Detective Ronnie Gardocki on the TV show “The Shield”. David had a lot of good ideas about his character. In fact, all the actors had lots of great ideas. These ideas motivated me to make one more pass on the script, which delayed the start date by a few weeks. Unfortunately, David was committed to doing a play and my delay caused a schedule conflict. If I waited for him to be done with the play, all my locations and preproduction would fall apart and I would have to start from scratch. So I made the hard choice to play the lead part myself. In hindsight, this was probably a good thing because there’s no way I could have completed the film otherwise. After the other actors had left town and there was no money, I could still finish the film because I was the lead, and I didn’t have to pay myself! Any interesting moments from the making of the movie you could share with us? In 1997, I had a rough assembly of the film completed. It was still missing a few scenes that had yet to be shot. I showed this rough cut to writer/filmmaker Mitch Brian, who is one of the creators of Batman: The Animated Series. He pulled no punches and critiqued many things that weren’t working in the movie. My ego was wounded, but I soon realized all his criticism was spot-on. There was a flashback subplot that wasn’t working. It was just wrong for the movie and it confused the audience. I cut it all out and filmed a new opening scene (where the guy’s car breaks down in front of the movie theater). That scene replaces about 20 minutes of a bad subplot. The good news was that dropping this subplot meant that I no longer had scenes to film. I was finished filming! After four years I could see the light at the end of the tunnel, and the movie came together very quickly after that. To this day, Mitch and I still make movies together. I became the editor/cinematographer on many of his projects. For a zombie movie there is very little gore was this an intentional decision? Yes, this was intentional for two reasons. One is budget. 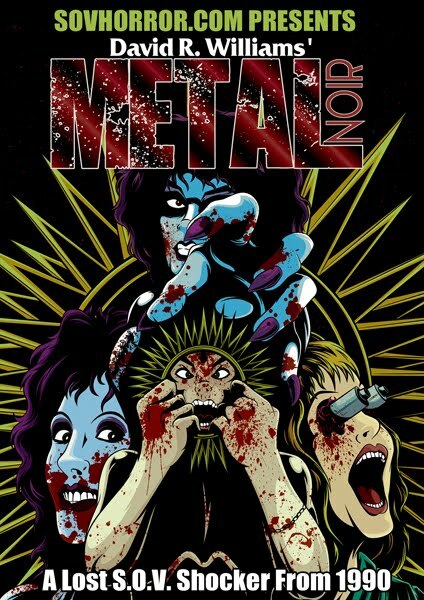 As the money ran out, I didn’t have the money to pay anyone to create a lot of makeup FX and blood gags. The second reason is that I’m not a big fan of gore for gore’s sake. Only in movies like “Evil Dead 2” or “Dead Alive” am I a fan of over the top gore because it’s somewhat comical. Even in Romero’s “Dawn of the Dead” or “Day of the Dead”, I’m a bigger fan of the story, characters and filmmaking than I am of the gore. Which, by the way Tom Savini is still the master of zombie gore. I’m proud to say that I got to meet both Tom Savini and George Romero at a film festival, when they presented me with an award for a short horror film I made in 2006. 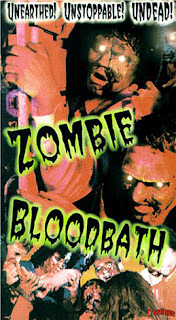 How did you secure the stock footage from Zombie Bloodbath for inclusion in the film? Todd Sheets, who directed “Zombie Bloodbath”, was a Kansas City filmmaker, just like I was. Since we both had the same first name, and we both made horror movies, people sometimes got us confused. I did some lighting for a weekend on his “Bloodthirsty Cannibal Demons”. We stayed in touch after that. When I needed mass zombie footage for my film-within-a-film, I asked if I could use scenes from “Zombie Bloodbath”. He agreed. At the time, most of his films were distributed by Englewood Entertainment. What was it like working with Englewood Entertainment? Any information you can share with us about them? They were essentially my bosses at the Fine Arts Theater, where I worked during the 90’s. I premiered “The Paranormal” at the Fine Arts, which is a memorable night in my life. They saw the film and liked it and offered to distribute it on VHS. Those were the days! What were your thoughts on the finished film when it was completed vs your thoughts on it today? At the time I was just relieved to get it done. It felt like a long chapter in my life had finally closed. It was bittersweet at the time because four years of my life went into making a film that ultimately very few people ever saw. And it made no money. But that film was essentially my film school. I made just about every mistake a filmmaker can make. And that’s good! Because making mistakes forces you to learn and get better. What I learned making “The Paranormal” was invaluable. For aspiring filmmakers out there, here’s one big lesson I learned. The first five minutes of your movie MUST tell the audience what kind of movie they are about to see. You have to illustrate what genre and what tone the movie will have. If you don’t do this, EVEN if the rest of the movie is great, the audience will struggle because the movie isn’t matching what you told them it was going to be. Beginnings are crucial. Get them right. Today, I cringe at a lot of “The Paranormal”. All I see are the mistakes. And I actually haven’t watched it all the way through in years. But there are still a few moments I’m proud of, and it exudes a youthful enthusiasm that I need to recapture. You can tell there’s a sheer joy of moviemaking in “The Paranormal”. Any chance we could see a re-release? Unfortunately, the master tape is not in good shape. The VHS copies out there in the world look better than the master in many ways. I digitized it to a hard drive, and did my best to color correct and restore it, but it’s not in great shape. Maybe one of these days I’ll re-release it. I still shoot short films and music videos. I teach film and video and work at a small video production company. I often work as a cinematographer for other directors. I was the director of photography of the 2008 film “Bonnie & Clyde vs. Dracula”, which is a fun genre film. I don’t make horror films much anymore, but I did make a horror short in 2013 called “Nighty Night”. And recently, I directed a Giallo-inspired music video for the band Other Americans.